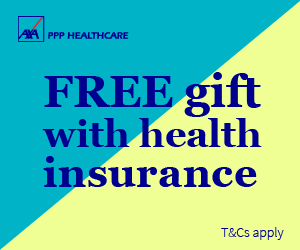 Prize DrawsWin a £1000 bundle of the latest hearing assisted technology! Win a £1000 bundle of the latest hearing assisted technology! This month we have teamed up with the retail team at Action on Hearing Loss, the leading charity in the UK in providing support for people who are deaf, have a hearing loss or tinnitus. To celebrate we’re giving away a technology bundle worth £1,000. 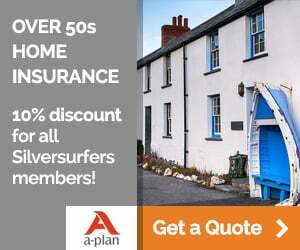 Age-related hearing loss is the most common type of hearing loss and affects more than half of all people aged over 50. Alongside ageing, there are other factors that might make people more likely to lose their hearing. 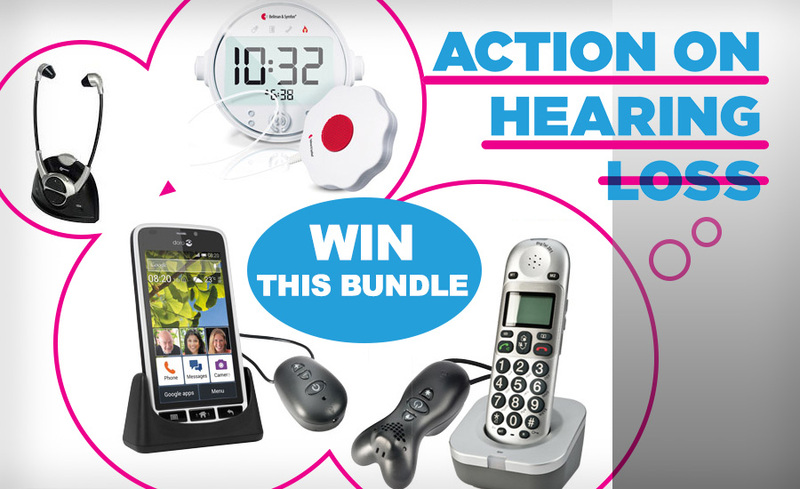 The product team at Action on Hearing Loss have helped thousands of people and compiled some of their bestselling hearing assisted tech products and one lucky winner will be taking home this amazing bundle of goodies. For more information about products for the deaf, hard of hearing or tinnitus issues, you can visit www.actiononhearingloss.org.uk or contact us on 0808 808 0123 or if you want to find out more. We are open Mon-Fri 9-5pm and happy to hear from you no matter what your query. I always miss the first word or two of a conversation ,very frustrating !! Excellent beneficial prize, fingers crossed. I have dreadful tinnitus and hearing loss so if I won these items it would make my life more bearable. Would be wonderful what anyone is saying if out with friends or at church on Sunday when Vicar preaching ! Mind you not always a bad thing !! I have tinnitus and some things I hear better than others. I can never tell. To be able to hear my grandchildren again would be wonderful. This fantastic prize could change my life! My hearing aids are ageing so new ones would be great. I suffer from tinnitus,it's terrible,I'm sure the prizes would help with my hearing . I think this is a wonderful prize. Fingers crossed that I may be lucky. I would find extremely helpful for both my husband who is deaf and for me. I suffer from tinnitus that sometimes drives me crazy. For the last 20 years my hearing has slowly got worse, then 2 years ago I had a heart attack. The side effects of one of the many tablets I need to take to stop me having another heart attack has reduced my hearing to zero. I wear hearing aids from the minute I get out of bed, and take them out when I go to bed. Given the choice of hearing loss or another heart attack, well, I'm sure everyone would choose hearing loss, so this technology would be so helpful. My hearing comes and goes because of an ongoing ear infections, so this technology will help. Both myself and my mother in law have hearing problems, so it will be a great help to me in my every day life and will assist her when she visits. I had a hearing test two week back and found out I needed hearing aids because even though I didn't notice it my self, I am apparently not hearing all the conversation when people are talking to me. I'm going next month to be fitted for hearing aids. The prize on offer would be handy for me for the future If I won. My children would be delighted as no more loud TV. I am always having to ask my husband to repeat what he has said. It would be lovely to have some hearing assistance! Yes Wendy my friends would agree !! Just beginning to feel the effects of age? hearing loss this would be most useful. A very useful package to win. I have tinnitus as well as hearing loss and am slowly driving my family mad - I need all the help I can get! My hearing's selective... but my Mum has genuine problems and I'd love to help her. I would love a telephone with amplifier as I keep having to ask people to repeat what they have just said. Also a better door bell ! This is for my husband who has industrial tinnitus and hearing loss. He now for a number of years has two hearing aids. This would be so helpful. I was diagnosed with hearing loss and severe tinnitus after a head injury from a road accident in 2009. My kids get annoyed as I find it hard to understand what they're saying some days. I wonder if my hearing loss is getting worse. Sounds just what I need ! Fantastic prize this would definitely help my ever so annoying tinnitus! Being unable to work I can't afford these hearing aids and I am sure my neighbors would appreciate the wi-fi TV listening device. I hope everyone is aware that the wearing of hearing aids qualifies us for disabled rail travel. This includes significant reductions, even at peak travel, for you and your accompanist. I have hearing aids for both ears supplied by NHS. I am grateful but sound quality is poor and anything that might help is worth a try! I have had very bad tinnitus for many years now and at times I just sit and hold my head and cry because the ringing is so loud. I have so much sympathy for anyone who suffers with this. I just long for complete silence. Deafness is treated as funny unless you are involved with it. Not hearing the 'jokes' at family gatherings or being able to hear children talking is very depressing so anything which helps to overcome it is very gratefully received. I too have had menieres for over 20 years now and suffer tinnitus and the usual thickening in the ear/head but as yet, no hearing aids! Doesnt help when hearing specialists tell you your hearings average for someone "your age"! It would be brilliant for my husband who is losing his hearing. This would be such a blessing. Even with N.H. hearing aids I am so limited, as they just make the background noise so loud, despite me adjusting aids to the appropriate setting! I feel quite miserable sometimes when I can't hold a proper conversation. Yes it IS very lonely being hard of hearing! This would be such a great prize ! Hearing loss can be so frustrating both to the sufferer and their family. It is reassuring that products are available to make life a little better.